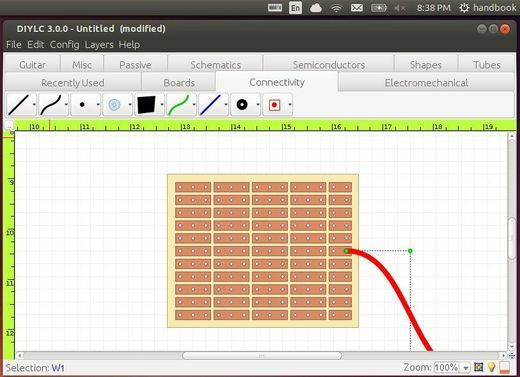 Want to draw PCB, Perfboard or Stripboard layouts on your Ubuntu or Linux Mint machine? Well, there is a free, open source application called DIY Layout Creator which works on Linux, Windows, and Mac OS X.
DIY Layout Creator (DIYLC in short) is freeware drawing tool developed with help of a large online community of DIY electronics enthusiasts. The goal is to provide a simple interface and enough power to let the user draw schematics, board/chassis layouts and guitar wiring diagrams quickly and without a steep learning curve. Also, it is build around the flexible open source framework that may be used to draw pretty much anything. Below is a sample board layout drawn in DIYLC3 (Click to enlarge). We can easily install DIYLC in Ubuntu 14.04, Ubuntu 13.10, Ubuntu 13.04, Ubuntu 12.04, Linux Mint from its repository. Once installed, open it from Unity Dash or Menu.